With the hustle and bustle of life today, you need travel gear that will really “have your back”. Traveling with a smart backpack is like having a trusty sidekick. 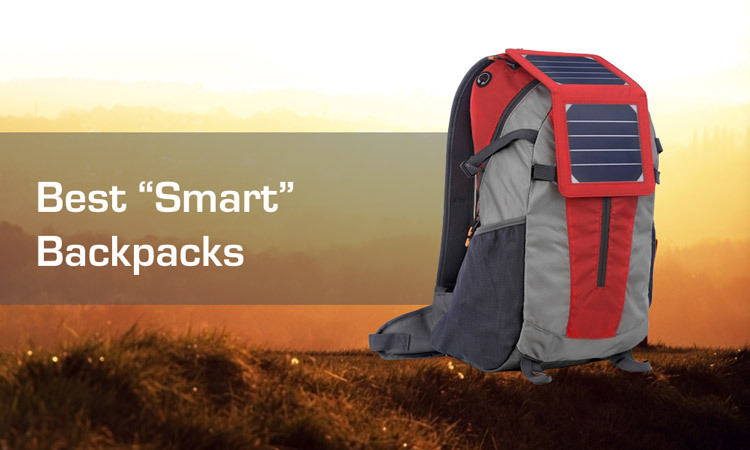 Here are our top 6 smart backpacks to make your life a little easier. 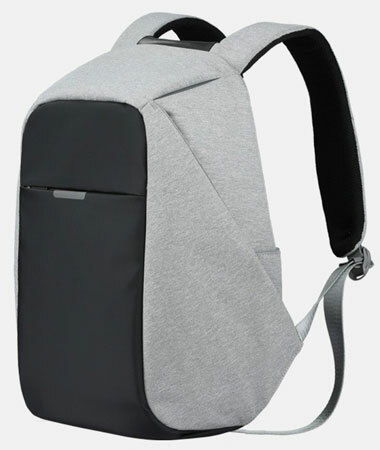 Oscaurt Travel Smart Backpack is a versatile gender-neutral backpack with a sleek and contemporary look. Fit with external USB and built-in charging cable it offers a convenient charging system for your electronic devices. This modern look bag has a simple clean design, and useful technology. It’s smartly crafted from water replant high quality material, making it durable and easy to clean. This backpack from Oscaurt is spacious without being bulky. Inside their is plenty of space in the main compartment with small pockets and slots for all the small things, like wallets, phones, pens, passports and and so on. It can house up to a 15″ laptop along with several notebooks, magazines or a tablet. I love the safety features of this bag. The zippers are well hidden to keep valuables secure. Their is even a reflective stripe externally that can be easily spotted in low-lit ares. The built-in USB port with charging cable offers convenient charging system. So you can recharge your devices anywhere, anytime, on the go. This bag is a steal. You can get all the above in 3 different modern colors, on sale for just around $30. It would be a nice bag for a young adult or teenager because the design is very young and attractive. If traveling by public transportation especially, it’s a safer bag. eBags Professional Smart Backpack is a low profile bag that’s adaptable with lots of smartly designed pockets and features to house your travel gear and devices. The professional discreet look of this bag would be appropriate for corporate casual and is even sleek enough to wear with suit. This corporate casual bag is all about flexibility. It’s wonderfully crafted to be professional, and adaptable to your travel needs. It doesn’t have a lot of bells and whistles, but what makes it smart is it’s ability to be easily fit with, and hold all your devices. Well organized pockets in the outer compartment fit small items perfectly, with a concealed pocket excellent for passports and boarding passes. A hidden water bottle pocket is well placed for easy discreet access. 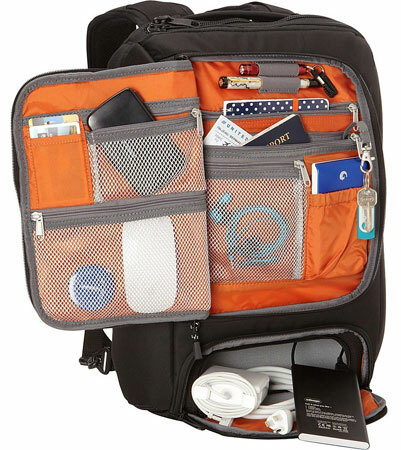 The large main compartment open with an L-zip to fit up to a 17.5″ laptop along with other goods. Inside there is removable bottom padding, that can be keep so nothing slides around, or removed to fit more gear. Even though this bag isn’t fit with Bluetooth or a charging system, it is equipped with what they call an “AC adapter garage”. Which again, is a discreet pocket at the bottom of the bag, perfect for cords and chargers. To top it off it has a TSA approved combination lock, can lock all the 3 main compartments. The contoured air mesh straps are made for comfort and convenience along with a top and side handle. A trolley handle pass-through is also added so it can slipped over another piece of luggage with ease. With over 800 reviews this bag is rated 4.5 stars. Needless to say users are pleased with this smartly crafted bag. At around $120, it’s a worthy investment that’s sure to last for years, especially since it comes with a lifetime warranty. 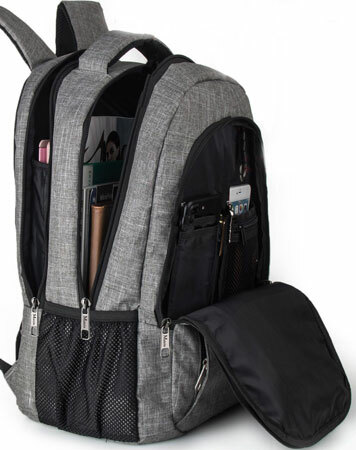 The highly rated modern bag Matein Travel Slim Smart Backpack made the list for it’s convenient technology. Made with anti-theft tech and a built in USB it’s a smart buy. Well crafted from waterproof materials it’s durable for the long-haul. But what makes this backpack special is it’s tried and true, it’s got over 400 reviews on Amazon and comes in at 4.6 stars. This backpack applies anti-theft technology. The zipper of the main pocket is fully hidden in the back of this bag. It’s also equipped with a secret pocket which is behind the bag. A separate laptop compartment is made to hold up to 15.6 Inch Laptop as well as 15 Inch, 14 Inch and 13 Inch Macbook/Laptop. One spacious packing compartment is roomy for daily necessities, and electronics accessories. 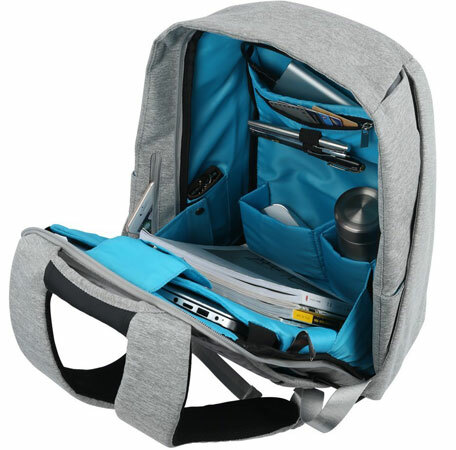 The front compartment is equipped with many pockets, pen pockets and a key hook. 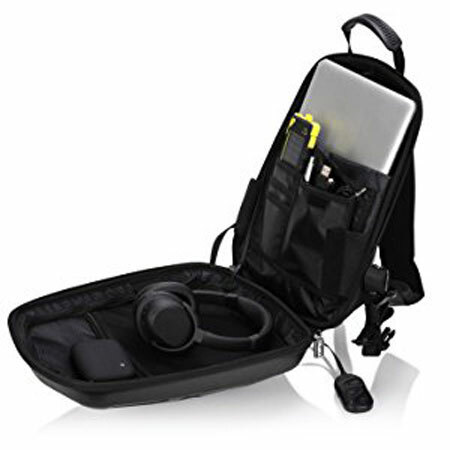 With built in USB charger outside and built in charging cable inside,this USB backpack offers you a more convenient way to charge your phone while traveling. 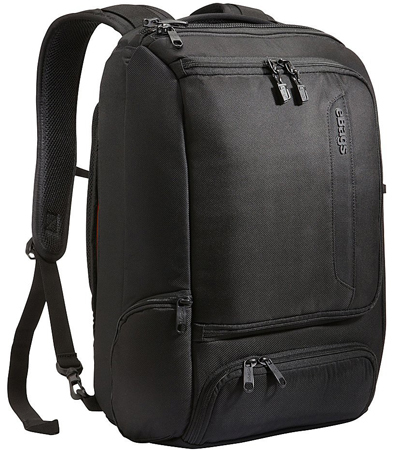 At just around $30 this a inexpensive backpack, worthy of being a travel companion. 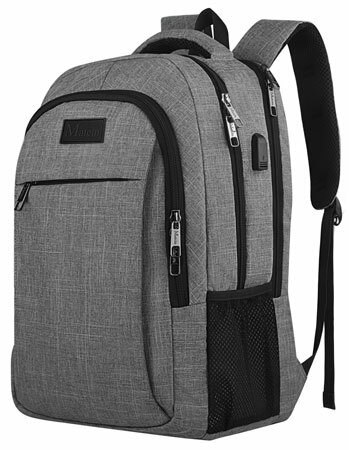 Modern, durable and fit with great technology, this smart backpack is a smart buy. 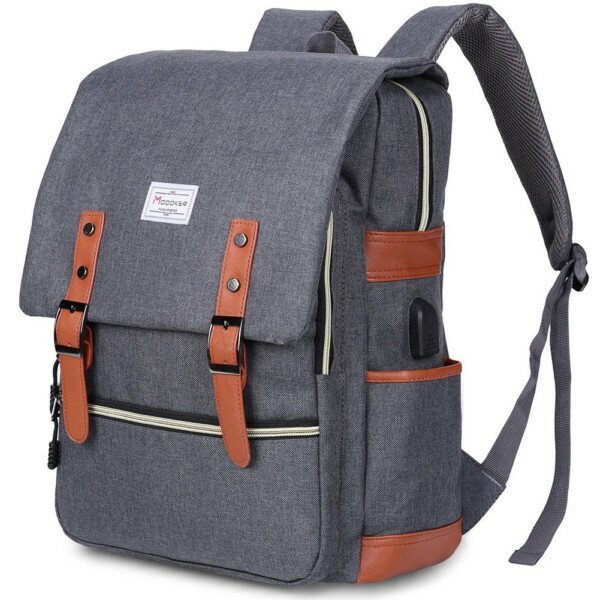 Users love this Modoker Vintage Laptop Smart Backpack. Style meets technology, makes a great product. It’s worth a look. This attractive looking gender neutral bag has got a lot of the same smart features as some of the other bags on this list. The USB charging port with set-in charging cable is convenient for your electronic device’s use anywhere. 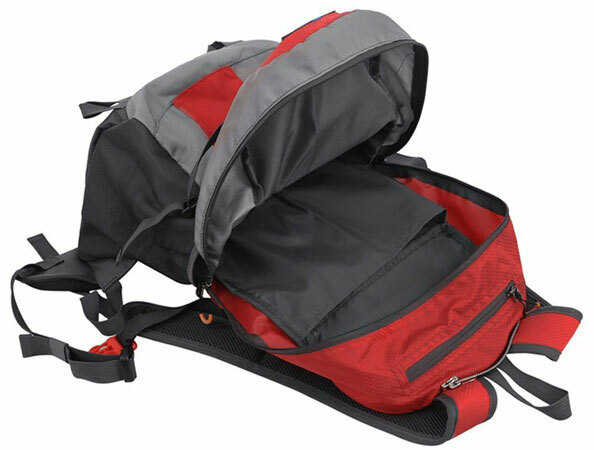 The durable backpack exterior is made from high quality lightweight polyester material and soft inner materials. It’s got a cool vintage vibe and plenty of pockets. 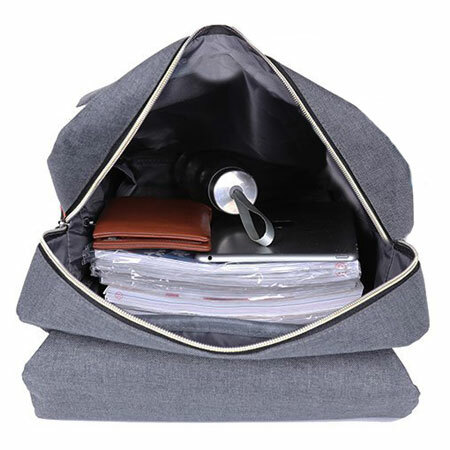 A total of 6 pockets – 1 roomy main compartment for books,1 laptop pocket, 1 front zipper pockets to hold valuable items, 1 pencil/pen case and 2 side pockets for water bottle or umbrellas. High user ratings, plus style and functional smart features this bag is worth the $30 bucks for sure! It’s great backpack regular trips with minimal weight. Young or old, male or female, this one’s a crowd-pleaser. Ingenuity certainly came into play with this ECEEN Solar Smart Backpack. The solar powered built-in battery can charge your devices while still leaving space for the essentials. Stay connected, even off the grid with this smart. This smart bag has understated urban vibe. The lightweight rip and water-proof exterior means you can take it with you on pretty much any adventure. The large main pocket is spacious enough for books, clothes and other essentials. An internal pocket is perfect for hydration packs, along with 2 side pockets for drinking bottle or umbrella, and top small pocket for phone, cable, earphone or other small things. The ergonomic carrying system and external frame are design for comfortable functionality. Adjustable suspension conforms to a range of torso lengths and the padded shoulder straps plus dual density foam hip belt offer ventilated comfort. But what really makes it smart, is the 3.5-Watt foldable and removable solar panel that powers a built-in battery. The portable charger is great for all your small mobile devices. Solar power is abundant, clean, renewable, and effective. Smart indeed. This is one of the most full-featured smart backpacks out there. If you travel like we do to third world countries, where electricity is not always consistent, this is a smart choice. At around $90, it’s unlikely to be disappointing. The TRAKK SHELL Waterproof Multi Function Bluetooth Speaker Backpack excites all adventurists! This baby is equipped with some cutting edge technology that will surely impress. I don’t know if you’re ready for this. Prepare to have your mind blown. Talk about smart backpacks. This backpack is SMART. The Trakk Shell includes every function needed to truly enjoy and enhance any excursion or trip that comes your way. It has just enough space to include your necessary carry-ons in a lightweight portable backpack. Multiple compartments provides enough storage space for your accessories, clothing, notebooks and so on. 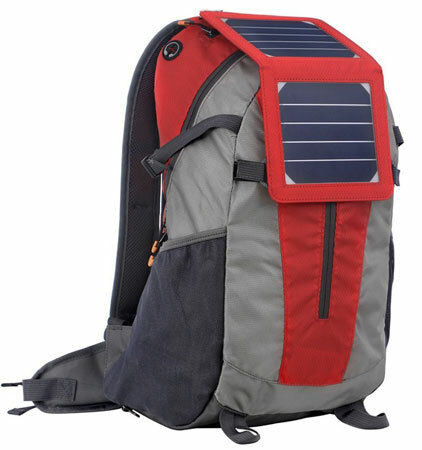 This backpack is manufactured to withstand all natural/unnatural conditions while still maintaining lightweight features. It’s crafted to repel water and allows for complete shockproof protection. So let’s talk about the technology. Bluetooth pairing allows you to take phone calls, control music, and even navigation without having to rummage through your bag. Connectivity technology allows your Shell to pair from a distance, up to 65 feet away! It can all be controlled with the included attached remote. 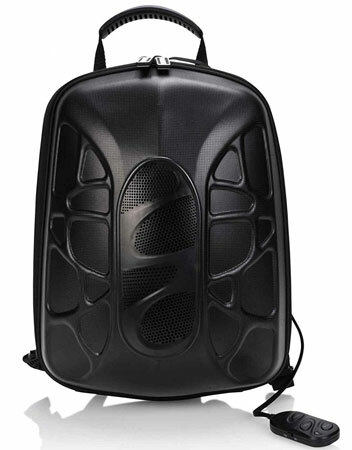 If that wasn’t enough, this backpack is fitted with a speaker that generates max-bass technology. Your friends will be impressed with your ability to bring the party anywhere you go by playing music from the built-in speaker. Power backpack includes an internal USB output power bank to charge all your USB enabled devices– smartphones, tablets, notebooks etc. The power bank is powered by a 5200 mAh battery providing 2 full charges for your devices. It can work up to 12 hours per single charge. This is a powerful little backpack. It looks sort of like a turtle shell, in a really cool way, and is just about as strong. Bluetooth, a speaker, USB… this may just be the smartest backpack ever. At just under $100, you’re really getting a lot.